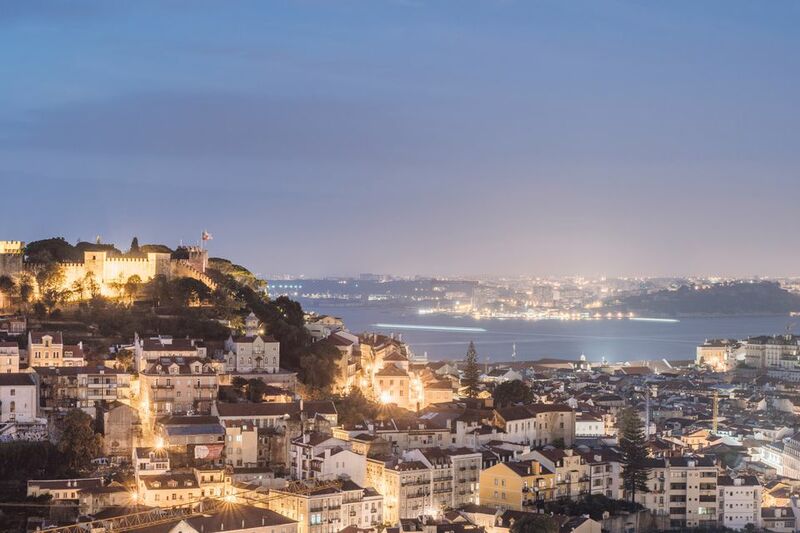 Lisbon is a beautiful city, full of crumbling old buildings, narrow cobbled streets, and endless opportunities to enjoy a glass of wine and a stunning view. Nowhere is that more true than Alfama, the oldest part of the Portuguese capital. Most first-time visitors to Lisbon end up there at some point, whether they're staying in the area or just eating, drinking, and exploring this historic part of the city. If you're heading there yourself, these are the top nine things to do in the Alfama neighborhood. Lisbon is a city of viewpoints, and one of the best and easiest to get to is Miradouro das Portas do Sol. With stunning views over red roofs out to the Tagus river, and a convenient kiosk serving beer, wine, and snacks, there's no better place to watch the sun go down and relax after a long day of sightseeing. If you're looking for the same view amid more upscale surroundings (or if all the tables at the kiosk are full), pop into the Portas do Sol bar and restaurant alongside. Either way, don't forget your camera! One of Lisbon's must-visit attractions, you can see the Sao Jorge castle from almost anywhere in the old town. It's a solid climb up through Alfama's winding streets to get there, so pack good walking shoes (or take a taxi instead!). Once there, you'll have unrivaled 360-degree views, plus the chance to wander the old castle walls, check out the old cannons on display, visit the camera obscura, and more. Plan to spend 1-3 hours inside, and arrive early or late in the day to avoid long ticket lines. Food and drinks are available inside, and tickets cost €8.50 for adults and children 10 years and over. Lisbon’s cathedral (Sé) is the oldest church in the city, with construction starting in the 1100’s on the site of an even older Moorish mosque. Grand and imposing, it offers a cool refuge from the heat of the Portuguese summer, with the highlight being the beautiful stained glass windows. Entry is free, although as with most churches, donations are always appreciated. Chances are if you've seen a postcard of Lisbon, it'll have a yellow tram on it. While these rattling old methods of public transport get plenty of use from locals, the number 28 in particular has become a tourist attraction in its own right. Winding from Martim Moniz to Campo do Orique, the #28 tram winds through the Alfama neighborhood for much of its route. It's a good way of getting close to the castle without having to climb the steep streets, as well as getting a great overview of the downtown area. It gets very busy and crowded in summer, however, and pickpockets can be a concern. Here's how to make the most of the experience. Spend any time in Alfama in the evenings, and you'll undoubtedly encounter the soulful sound of the city's famous fado music. Whether you're walking past a fancy tourist restaurant or a tiny hole-in-the-wall bar, the centuries-old musical style can be heard almost anywhere in the neighborhood. If you'd like to know more about it, head to the small, highly-regarded Fado museum ahead of time. Full of information about the history and meaning of the music, the five euro entry fee includes an audioguide that helps put everything in context. Expect to spend up to an hour inside. Sitting atop a hill in Alfama, the white dome of the National Pantheon is a dramatic feature of the Lisbon skyline. The history of the construction process is almost as interesting as the building itself, with work beginning in the 1600’s, and remarkably, not finishing until nearly three hundred years later. It took so long that the phrase obras de Santa Engrácia ("Saint Engrácia's works") became a synonym for a project that never ends! After snapping a few photos of the exterior from nearby viewpoints, head inside to climb to the top of the dome, and view the tombs of some of Portugal's most famous people. Entry is free on Sundays, with tickets otherwise costing €3 from Tuesday to Saturday. The Pantheon is closed on Mondays. Despite the name, vendors at Lisbon's most famous flea market insist that nothing on display has been stolen. Whether that's true or not, you'll find an astonishing array of items for sale at the Feira da Ladra, with stalls sprawling over a wide area near the Pantheon and Saint Vincent's church. One person's trash is another's treasure, as they say, and with the mountain of offerings, you'll almost certainly find something to take home as a souvenir. Get there early for the best pickings, as the most unusual and interesting items are gone by breakfast time. The fair runs on Tuesdays and Saturdays, from 6 am until sellers have had enough and head home. Can't get enough of the city views (or walking uphill?) Head to Miradouro da Senhora do Monte, the highest point in the downtown area, and have your camera at the ready. Like all good viewpoints in Lisbon, it's particularly popular at sunset, and that's no surprise: the views are the best in the city. Towering old trees offer welcome shade, and nearby cafes and bars are well-stocked with cold drinks to help recover from the steep walk to the top. If you really can't handle the thought of yet another climb, though, tuk-tuk drivers also prowl the bottom of the hill, offering rides for a few euros. Beautiful blue and white azulejo tiles can be found on buildings throughout Portugal, and the National Tile Museum does a great job of displaying and explaining their five centuries of history. You'll pay five euros to enter, and can easily spend two hours or more exploring the museum's various collections. There's a free companion app for iOS and Android (and Wi-Fi in the lobby to download it), which provides additional information and acts as an audio guide in Portuguese and English.